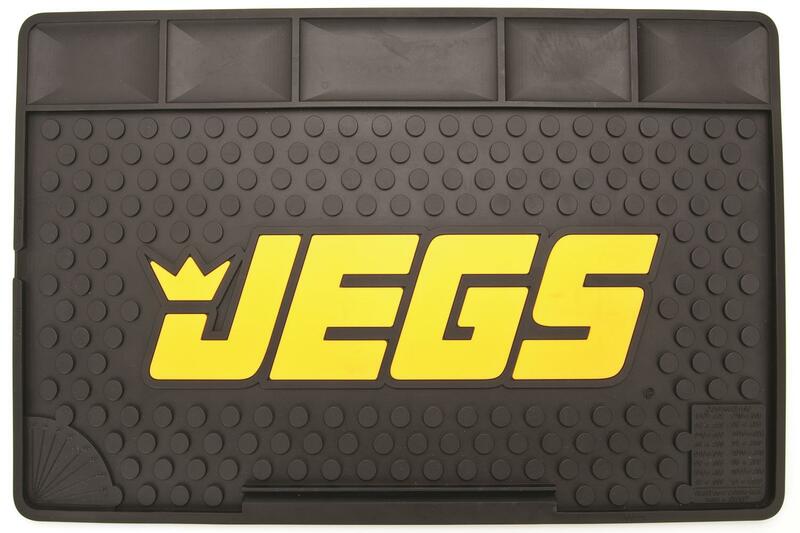 JEGS Workbench Utility Mat provides a soft 24" x 16" work space for fragile items, as well as a surface with grip for small parts. The bottom corners feature a protractor diagram for selected angles and a conversion chart for common fractions. Ideal for carb, alternator, and starter rebuilds, etc. 80170 is rated 4.3 out of 5 by 14. Rated 5 out of 5 by TedT from Work surface mat Also works well as a car floor mat, especially when purchased on sale. Rated 5 out of 5 by bradtoolmkr from protects my work bench keeps grime off my work bench top. keeps parts from rolling off. mat was rolled very tight in shipping and even using a heat gun I am having difficulty getting it to relax and lay flat. may end up using large roofing nails! Rated 5 out of 5 by Heyjay from perfect!!! Bought about a month ago. Received faster than expected. Got it to put my total over the free shipping mark. Kind of a freebie. Rated 5 out of 5 by Bexx89 from I bought 2 of these about 3 weeks ago for my toolbox at work. My only complaint is that the edges are still curling from being packed like a burrito. Other than that, I’m happy with the product. Rated 5 out of 5 by Paul0169 from Great simple item I bought one on sale just to try out. I liked it so much I bought a bunch more so I would have extras in case one was damaged. There is one on the bench in the trailer that gets used just about daily. Super simple, but very useful item. Rated 5 out of 5 by HemiHead from Jeg's 80170 Bench Mat I needed a nice size mat for my tool cart to reduce scratches and dents. This fit like a glove! You can add this item to your shopping cart and begin the checkout process, when you enter your address you will see the shipping options and costs. Do you ship internationally? If so how much is it to the UK?